Modern office design and decorating with bright interior colors create energizing and comfortable open spaces, perfect for work and short breaks. Lushome presents a new office design by Nayada, a European company which develops contemporary office furniture and inspire to blend bright interior colors into neutral office palette. 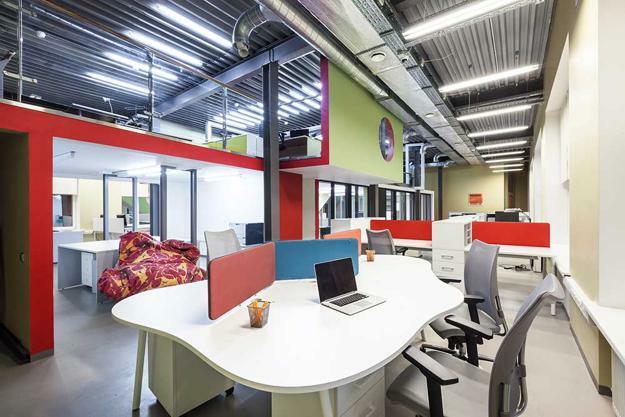 Multifunctional and colorful, cheerful and modern office designs provide numerous opportunities for people to enjoy their contemporary work spaces and places for rest. Creative elements and design solutions, combined with bright interior colors add character to office designs and turn them into interesting, comfortable and modern interiors. Modern office design is about creating multifunctional work spaces, suitable for men and women, pleasant and contemporary, featuring adjacent rooms for rest and meetings, and providing some privacy while using space saving interior design solutions. A two-story structure in the center is a manager office. 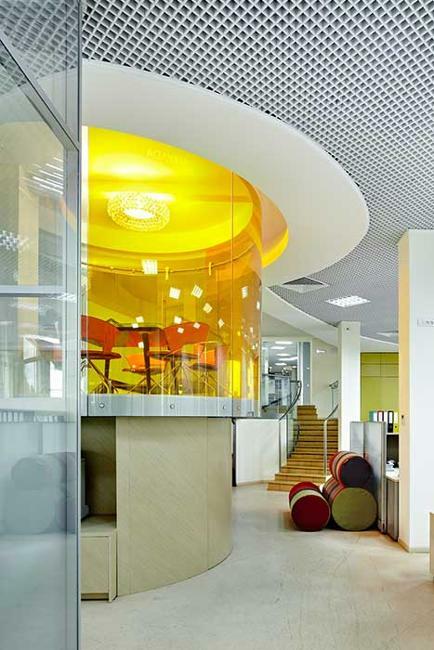 Th e glass structure add dynamic and contemporary vibe to the entire modern office design. Engineers and designers in Nayada occupy open spaces below, organized around the central glass office. 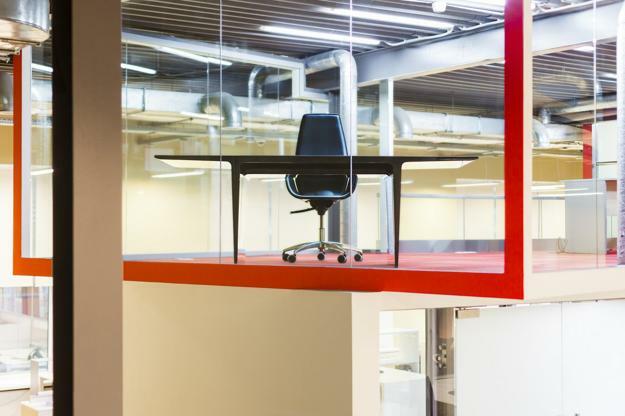 Employees who work in the office, but do not have fixed desk locations may work in Clouds, created with mobile dividing screens. These screens can be easily rearranged or removes creating various furniture placement for individual and team work. Flexible and smooth lines, neutral colors and bright accents make multifunctional and contemporary office design feel softer, more inviting and comfortable. 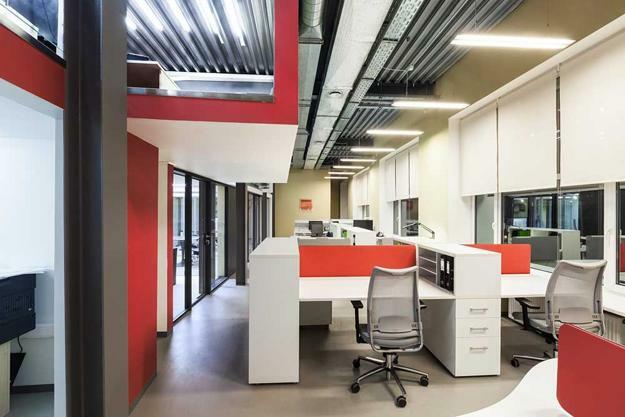 Bold red color accents, creative lighting ideas, stylish combinations of bright interior colors and geometric forms bring a youthful feel and energy into modern office design, and spice up interior decorating. The office can be crossed on a short break to enjoy a coffee or talk, sitting on special coffee point, high position which mobilizes not sit around and stay in working tone.